A little wine, a little laughter, a little cruising and whole lot of fun! Join Spirit Cruises as they bring onboard Laurie Forster, The Wine Coach, for a unique cruise that combines wine tasting, comedy and interactive games that will allow the audience to be part of the show. “Something to Wine About” Dinner Cruise is set for Friday, April 8 from 7-10:00 PM with boarding at 6:30 PM at The Promenade. The event includes a complimentary glass of bubbly Prosecco upon boarding, four wines to taste, a delicious dinner buffet, a DJ and Laurie’s hilarious comedy show, combining her sharp wit, amazing knowledge of wine and funny anecdotes about real life! Tickets are $76.90 per person and passengers must be 21 or older with valid ID. For more information, log onto www.spiritcruisesbaltimore.com or call (888) 741-0283. Laurie Forster, the Wine Coach, is one of America’s leading wine experts and author of the award-winning book The Sipping Point: A Crash Course in Wine. Laurie is a certified sommelier, national speaker and TV personality who is not afraid to tell you her first wine came from a box. Her edgy approach to demystifying wine caught the eye of major networks and led her to guest appearances on Dr Oz, Martha Stewart Living Today and FOX. Forster is also the host of The Sipping Point on WBAL radio and her mobile application “The Wine Coach” was listed as one of the Top 8 Wine Apps in Wine Enthusiast. Laurie regularly speaks across the country where she “edutains” a client list that includes MetLife, Discovery Channel, Microsoft, LG Electronics, National Association of Catering Executives, American Cancer Society and McCormick & Company to name a few. She’s performed her comedic wine tasting at legendary locations like Carolines on Broadway, DC IMPROV, Caesars Atlantic City, Harrah’s Casino, City Winery NYC & Chicago and Broadway Comedy Club. 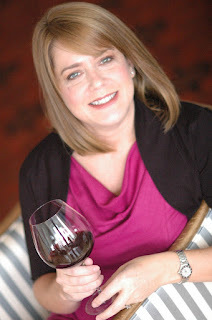 Laurie Forster, The Wine Coach, currently lives in Easton, MD with her chef husband Mike and daughter Michaela.